Tune in at noon Eastern tomorrow to the Roderic Deane Blog Talk Radio Show. RD will talk to Josh Painter of Texans for Sarah Palin at the start of his show. Then he will interview Tami from Moms 4 Sarah Palin at around 11:15 a.m. I’m scheduled to be on at 11:30 a.m. We’ll discuss Governor Palin, no doubt spending quite a bit of time conversing about The Undefeated. Palin doco wins public praise (01:25) The Undefeated, a documentary tracing Sarah Palin’s rise to political power, has opened in US theatres to overwhelmingly positive opinion. It may not be “Harry Potter,” but another film featuring a bespectacled protagonist is racking up strong pre-sales before its national roll-out this weekend. “The Undefeated,” a glowing look at failed vice-presidential candidate and former Alaska Governor Sarah Palin has already sold out a show in Grapevine, Texas (population 46,000), according to the distributor Cinedigm. Grapevine isn’t exactly a teeming metropolis but the film is set to roll out across Tea Party country in 10 AMC theaters. When Sarah Palin said, “More government is not the answer,” the audience in theater 8 at AMC Barrett Commons 24 erupted with applause.”The Undefeated” premieres at AMC Barrett Commons 24 with an appearance by Director Stephen Bannon. Reactions from filmgoers attending the screening were overwhelmingly positive. “I believe she’s honestly just a great person,” said Garrett Wilson, who traveled from Chatsworth, Ga. to attend Friday night’s screening of the film. “Run, Sarah, run!” shouted Californian Sherman Roodzant, 64, as the final credits rolled on the 1:10 p.m. showing in a half-filled theater in Orange. Roodzant drove 150 miles (240 km) to see it and said it was worth every mile. Faithful fans arrived early. Donna Galloway drove all the way from Beaumont for the debut. ”Undefeated is about having losses but coming back for victories,” said Galloway. While a wizard named Potter is on track to rule the box office this weekend, it was a former governor named Palin who had conservatives excited at the AMC Grapevine Mills 30 theater Friday evening. The Grapevine theater is the only one showing the film in North Texas. At least one of Friday’s scheduled viewings sold out.One fan brought a wagon adorned with a sign reading “Texas is Palin Country” and filled with postcards touting the former vice presidential candidate’s views and accomplishments. I find it hilarious that so many in the mainstream media are writing articles about how they don’t know how the movie has done thus far. It would be pretty easy to find out this information and the fact that reporters are actually publishing articles about how they don’t know how the movie is doing thus far suggests that they want to find out. If reporters did try to find out this information, they’d be forced to report that The Undefeated as of yesterday had the strongest average per screen attendance of any movie shown at AMC theaters sans Harry Potter. I join Governor Palin in congratulating The Undefeated team on their success as she did on Facebook today. A successful opening is wonderful, and it’s what we expected. Let’s keep the momentum. More people need to see this film, which reveals the truth the media won’t tell you about Governor Palin’s stellar career in the state of Alaska. To buy tickets, go here. Keep in mind that theaters have sold out, so without pre-purchasing tickets, you face the possibility of missing out on any particular showing. I, therefore, still strongly recommend pre-ordering your tickets. If the film is not showing in your city, all hope is not lost. Vote to have it shown in your area by clicking here. 4pm showing of ‘The Undefeated’ ends with five minute standing ovation in Atlanta! Atlanta – 7pm showing of ‘The Undefeated’ sold out 3 hours in advance! “The #Undefeated” 4pm showing in #OrangeCounty is packed full except for the “stiff neck seats” that nobody wants ever. AMC Ahwatukee theatre mgr told me they sold so many tickets for #Undefeated that they had to move it to a bigger screen! Undefeated sold out 7:10 and 10:04 showings in Kennesaw. #1 movie in this theater tonight! People in the theater CHEERED when they saw Palin at the tea party rally. Kenesaw GA 3 showings sold out!! How come nobody in the MSM is RTing that @PalinUndefeated is selling out and getting standing Os?! Aren’t they “objective” RTers?!? Full House at Universal Cineplex Orlando, FL for ‘The Undefeated’! MSM – Where are the “empty theaters” now? just got back from the movie. My 3 skeptics will now be a part of Sarah’s Army. People around me are saying, “WOW” about the frivolous ethics complaints. They didn’t know. Audience applauding Sarah’s inaugural address in #Undefeated in Kennesaw! Amazing! People in this theater had NO idea about ethics complaints & why she resigned! They do now! No sir, not too bad at all. Wonder how the Democrat Party state chairman in Arizona will explain his prediction that there would be low turnout for the film in Phoenix? 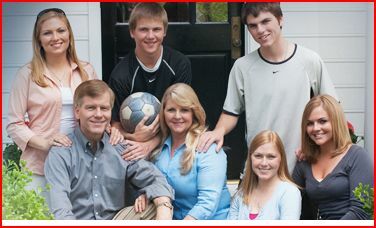 Virginia Governor Bob McDonnell possesses many fine qualities which would make him an outstanding vice-presidential candidate, and doubtless, an outstanding vice-president too as a glance at his resume will show. A good speaker, chosen by the GOP to answer President Obama’s State of the Union address, a businessman, a veteran, and a family man. There are of course other potential candidates who also have many striking qualities, although few would have been elected with 59% of the vote. What McDonnell possesses, in a campaign allied to Palin, apart from bringing the traditional North/South ticket balance, and the new female/male balance, is the capacity to win the election by his being from what appears to be the key state whose winning or losing will decide who is to be the next president. 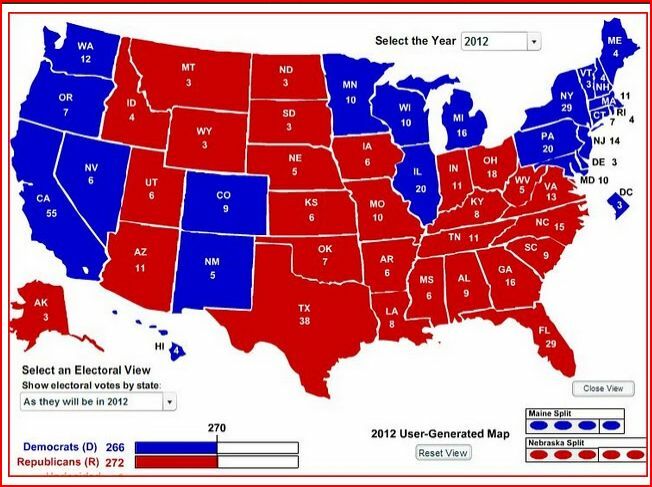 The map below shows a very tight election result if everything goes right for the GOP. Initially I considered that Florida would be the key state, and perhaps Rubio, or West would be the deal breaker as vice-president. However, even with the Republican Governor being unpopular at the moment, the polls in Florida have moved markedly against President Obama. Further, with the little noticed change voter ID laws and in the felon voting law, one benefit to the GOP of the 2010 sweep, as is the GOP winning the Ohio Governorship, which can only assist winning that rust belt state, Florida, at this point in time, looks a lock. Certainly McDonnell, as a Southerner would only add to the GOP’s chances of winning Florida as well. If then Florida is considered safe, then Virginia, which, like Florida was a key win for Obama, becomes absolutely crucial. If it is lost then the Dem’s electoral college votes go up to 279 and they can afford to lose Colorado and still win with 270. On every count a Palin/McDonnell ticket looks the GOP’s best bet in the Electoral College which, as Bush showed in 2000 is the only result that counts.